The shared server architecture uses a dispatcher process to direct client connections to a common request queue. An idle shared server process from a shared pool of server processes picks up a request from the common queue. This approach enables a small pool of server processes to serve a large number of clients. A significant advantage of the shared server model over the dedicated server model is reduced system resources, enabling support of an increased number of users. A process that enables many clients to connect to the same server without the need for a dedicated server process for each client. The dispatcher as Service Handler handles and directs multiple incoming network session requests to shared server processes. A dispatcher can support multiple client connections concurrently. Each client connection is bound to a virtual circuit. 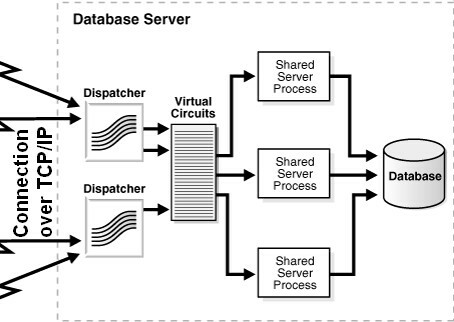 A virtual circuit is a piece of shared memory used by the dispatcher for client database connection requests and replies. 3 - The client is now connected to the dispatcher 1 - The listener receives a client connection request. to the client in a redirect message. 3 - The client connects directly to the dispatcher.